Top 5 Credit Repair Companies, a website that brings its readers reviews about credit repair companies, recently announced its launch. To calculate the ranks of each credit repair company and show visitors the best ones, the website uses a special formula that employs customer votes. Each company’s prices, services, attorney resources, reputation, and Better Business Bureau ratings also play a major role in how Top 5 Credit Repair Companies ranks them on the website. Top 5 Credit Repair Companies takes damaged credit scores very seriously and works tirelessly to help its readers find the ideal company that will restore their credit scores. According to an article available on the website, one of the top credit repair companies is Credit Assistance Network. With a rating of almost four and a half stars and 768 votes, Credit Assistance Network is praised for its knowledgeable employees, real-time updates, and affordable monthly rates. Top 5 Credit Repair Companies notes that Credit Assistance Network battles against credit-report inaccuracy with diligence and determination, working with clients to ensure that all disputed items are resolved. Top 5 Credit Repair Companies recommends Sky Blue Credit for any credit repair needs, as well. The company, which has been in the credit repair business since 1989, offers fast results in as little as six months. Sky Blue Credits’ A+ rating with the Better Business Bureau and low monthly rate of $59 earned the business the number two spot on Top 5 Credit Repair Companies’ list. 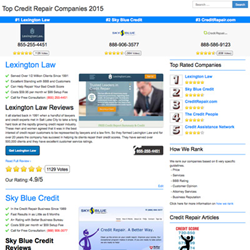 Lastly, with a rating of almost five stars and over 1,000 positive votes, Top 5 Credit Repair Companies ranked Lexington Law as the top credit repair company in the nation. Founded in 1991, the company has over 500,000 clients and excellent customer service ratings. Lexington Law offers free consultations upon requests. Individuals interested in learning more about Top 5 Credit Repair Companies and its work can visit the website for additional information. Readers are encouraged to contact the website through its online form with any questions that they may have.